I, Rostyslav Shaposhnikov, a Ukrainian journalist have been living in the United States since 2015. Now, I stay in the US because of the Ukrainian government politically persecution of me. 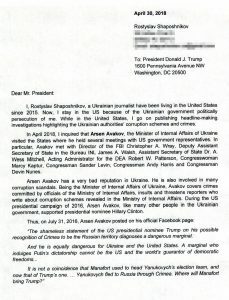 While in the United States, I go on publishing headline-making investigations highlighting the Ukrainian authorities’ corruption schemes and crimes. 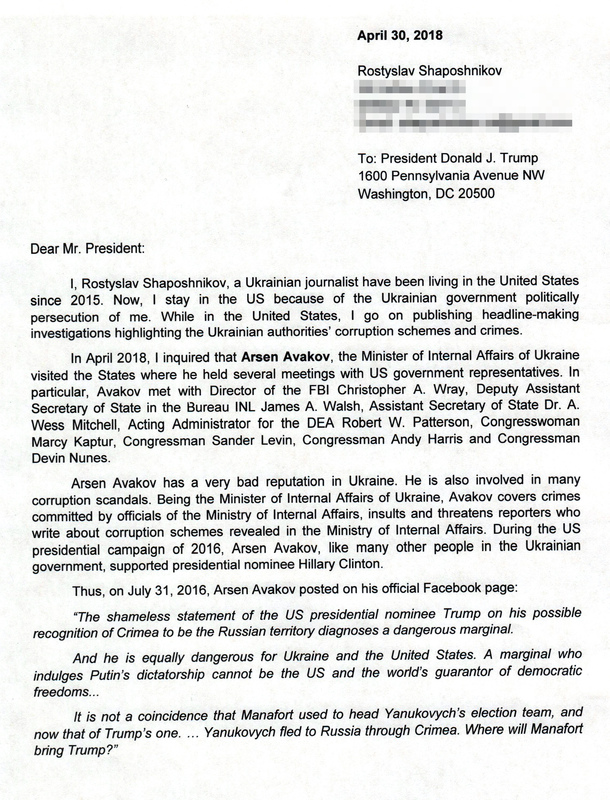 In April 2018, I inquired that Arsen Avakov, the Minister of Internal Affairs of Ukraine visited the States where he held several meetings with US government representatives. 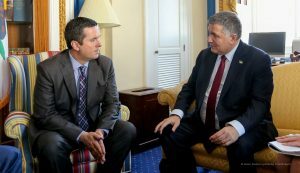 In particular, Avakov met with Director of the FBI Christopher A. Wray, Deputy Assistant Secretary of State in the Bureau INL James A. Walsh, Assistant Secretary of State Dr. A. Wess Mitchell, Acting Administrator for the DEA Robert W. Patterson, Congresswoman Marcy Kaptur, Congressman Sander Levin, Congressman Andy Harris and Congressman Devin Nunes. Arsen Avakov has a very bad reputation in Ukraine. He is also involved in many corruption scandals. Being the Minister of Internal Affairs of Ukraine, Avakov covers crimes committed by officials of the Ministry of Internal Affairs, insults and threatens reporters who write about corruption schemes revealed in the Ministry of Internal Affairs. 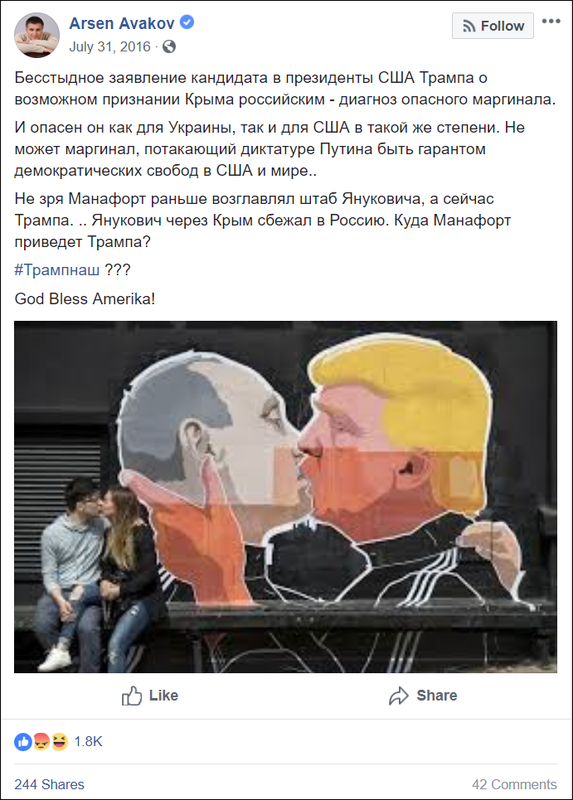 During the US presidential campaign of 2016, Arsen Avakov, like many other people in the Ukrainian government, supported presidential nominee Hillary Clinton. 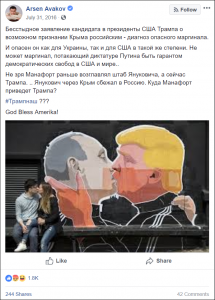 “The shameless statement of the US presidential nominee Trump on his possible recognition of Crimea to be the Russian territory diagnoses a dangerous marginal. 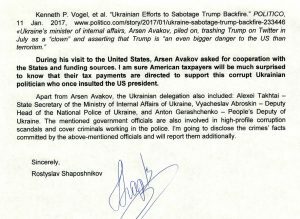 During his visit to the United States, Arsen Avakov asked for cooperation with the States and funding sources. 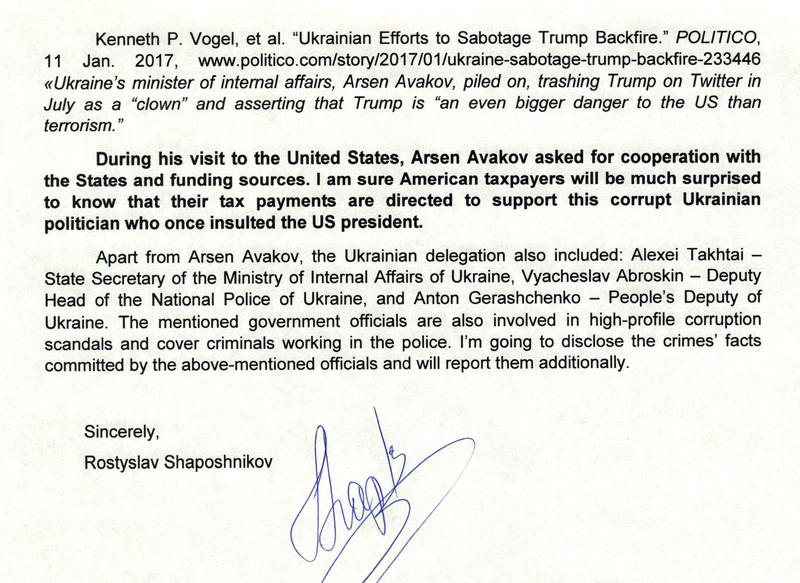 I am sure American taxpayers will be much surprised to know that their tax payments are directed to support this corrupt Ukrainian politician who once insulted the US president. Apart from Arsen Avakov, the Ukrainian delegation also included: Alexei Takhtai – State Secretary of the Ministry of Internal Affairs of Ukraine, Vyacheslav Abroskin – Deputy Head of the National Police of Ukraine, and Anton Gerashchenko – People’s Deputy of Ukraine. The mentioned government officials are also involved in high-profile corruption scandals and cover criminals working in the police. I’m going to disclose the crimes’ facts committed by the above-mentioned officials and will report them additionally.